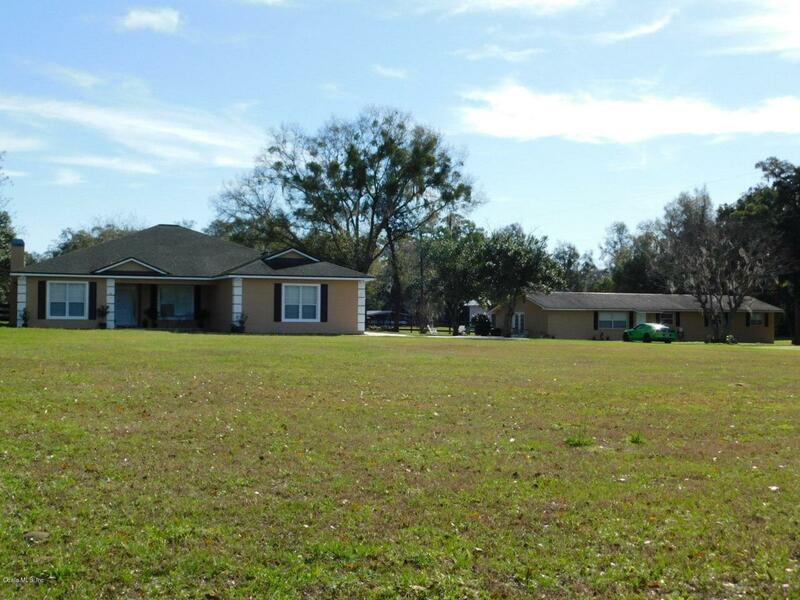 OCALA FARM, 9.8 ACRES, 10 min. to downtown shops, restaurants. TWO HOMES, room for extended family or rental income. 8 stall barn, 44x60 building with a lounge that has a/c and 3/4 bath. 38x54 pole barn w/concrete floor for equipment/trailer storage. Both homes are meticulously kept, cement block construction. Main home has 4 beds, 2.5 baths, 3 car garage. 2nd home has 4 bedrooms, 3 baths. Tile floors in both for easy care. Chicken coop/house, perimeter no-climb and board fencing, grassy paddocks ready for turn-out. Nice 2 stall run-in. Electric gate entry. One separate acre in back has old well & septic, untested. Call today!